Purple deadnettle is an introduced invasive annual species that originates in Europe. It is now found in many US states (AK, AL, AR, CA, CO, CT, DC, DE, GA, IA, ID, IL, IN, KS, KY, LA, MA, MD, ME, MI, MO, MS, MT, NC, NE, NH, NJ, NY, OH, OK, OR, PA, RI, SC, TN, TX, UT, VA, VT, WA, WI, WV) and in Canada is found in Quebec, Ontario, and British Columbia (USDA 2010). In British Columbia, it is reported from southwestern BC. and a few interior locations. Two varieties of this species are reported in BC: var. incisum(sharp-toothed) and var. purpureum (round-toothed). Large purple flowering patches of this species are prominent in the spring in the Fraser Delta, in agricultural fields and along disturbed roadsides edges (late March, early April). USDA. 2010. 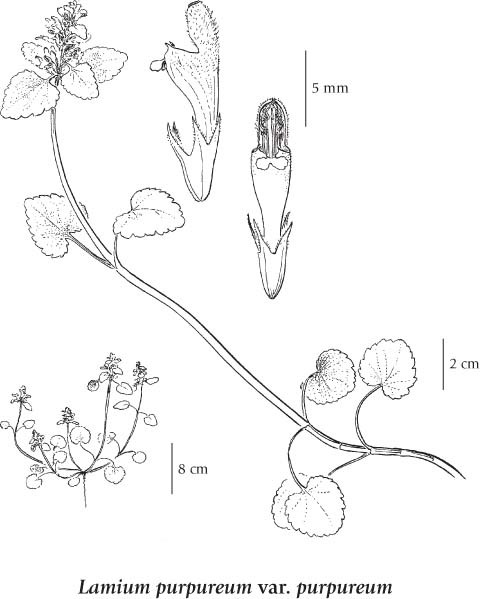 Plant profile for Lamium purpureum. United States Department of Agriculture. Available Online. Annual herb from a short taproot; stems branched from the base, reclining, inconspicuously hairy, 10-40 cm long, often somewhat purple tinted, 4-angled. Opposite, egg-shaped to almost round, 1-5 cm long, obtuse at tip, heart-shaped at base, margins toothed with rounded to somewhat sharp teeth; leaves all stalked, the stalks 1-3 cm long. Inflorescence of several axillary flower clusters at ends of branches; bracts leaf-like, but smaller than leaves and uppermost unstalked; corollas tubular, pink-purple, 10-15 mm long, longer than calyces, hairy outside, with or without a ring of hairs inside near the base, the hood-like upper lip 2-4 mm long; calyces tubular bell-shaped, 5-6 mm long, the slender teeth firm, unequal, somewhat spreading, about as long as the tube, hairy. Two varieties occur in BC. The var. 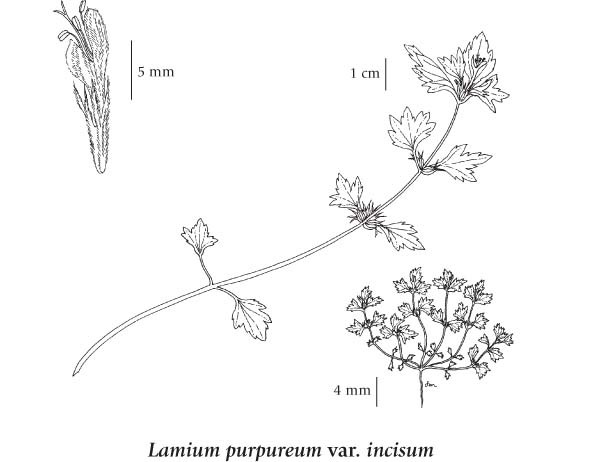 incisum is usually considered to be of hybrid origin between L. moschatum Mill. and L. purpureum. 1. Leaves deeply sharp-toothed ..... var. incisum (Willd.) Pers. Mesic to dry waste places and roadsides in the lowland and montane zones; frequent in SW BC, infrequent E of the Coast-Cascade Mountains; introduced from Europe.